Sadio Mane and Mohamed Salah both scored within the space of three minutes in the second half to send the Anfield club back to the top of the Premier League. England midfielder Henderson forced the breakthrough as he teed up winger Mane’s headed opener shortly after half-time with a delicate cross to the far post. 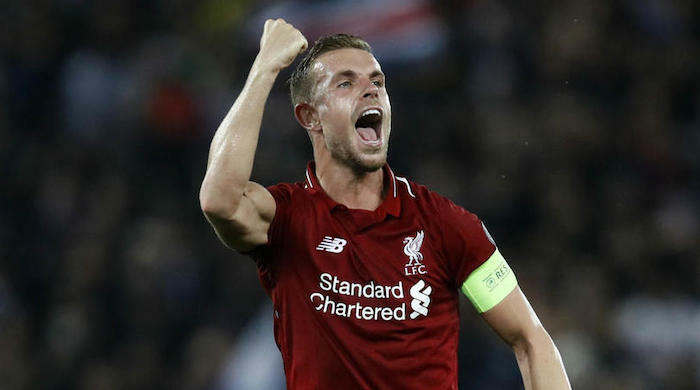 The 28-year-old has thrived in a box-to-box role in recent matches, and his assist further justified Klopp’s decision to move him further upfield. ‘I’ve said it since the first day I arrived, and my opinion hasn’t changed: he’s a fantastic skipper for this team,’ Klopp told Sky Sports. ‘On and off the pitch, he’s fantastic. Liverpool’s win was their sixth straight in all competitions, and a first at home to Chelsea in the Premier League since 2012. It also restored the Reds’ two-point advantage over title rivals Manchester City, who won 3-1 earlier at Crystal Palace. They currently hold a 2-0 aggregate lead over the Portuguese side, and will be looking to advance to the last four of the competition for the second year running. They will end their Premier League with games against Huddersfield, Newcastle and Wolves.